Hey all! Today I decided to do a simple nail, because #1. I fell asleep on the couch last night before I painted my nails and #2. I woke up late, so it was simple nails or be late for work, and since nails don't pay any bills (they CAUSE bills ;)) I went for simple work and punctuality. I used China Glaze Salsa as a base, with China Glaze TMI applied with Konad Image Disk m64. For the tips I used China Glaze Emerald Sparkle. Topped it all off with 2 coats of Seche Vite top coat. 7 More days until Christmas!! I know what you mean... its all about priorities. 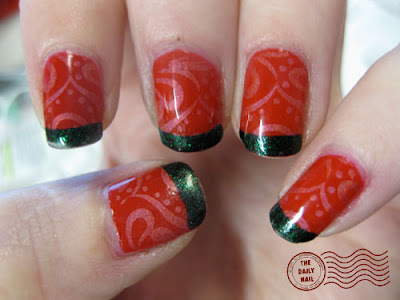 I know that to you, this is a fast mani- but to me, this is amazing! I can't get the Konad thing without smearing. The ChG Salsa and TMI are beautiful compliments to each other! I know I keep saying "elegant", but to say "classy" sounds "not classy", you know? So again, it is so very elegant! you should do a moon manicure with white on the bottom and black on top. after christmas, though. omgoodness! i just did my christmas nails and used the exact same konad pattern!! i used a generic red as a base and china glaze metallic muse (you were right! those khrome editions do show up amazingly well) for the pattern. no tips though, still haven't been able to work that out with the konad system.